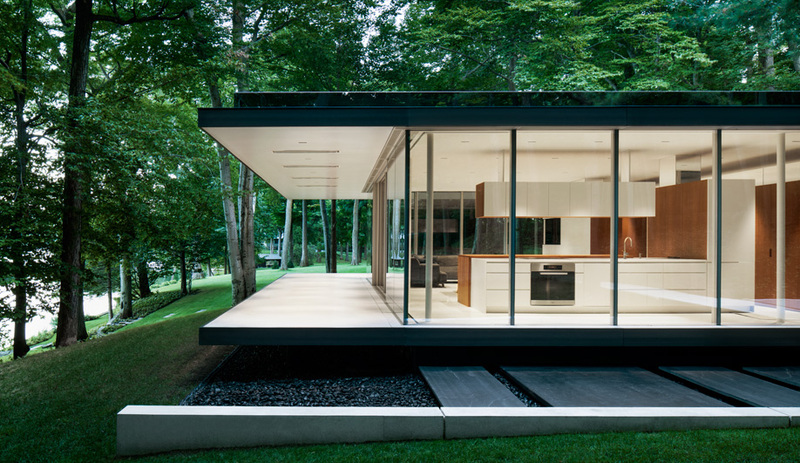 Not all glass houses are created equal. 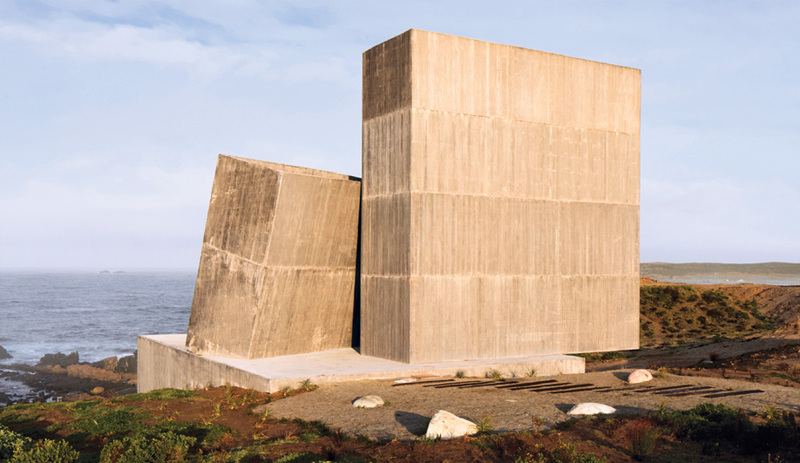 This one, constructed by Daoust Lestage outside Montreal, is an energy-efficient marvel. Pavillon du Lac plunges visitors into nature. It is almost nothing: two squarish white slabs, a roof and a floor, all of which hover in the forest. 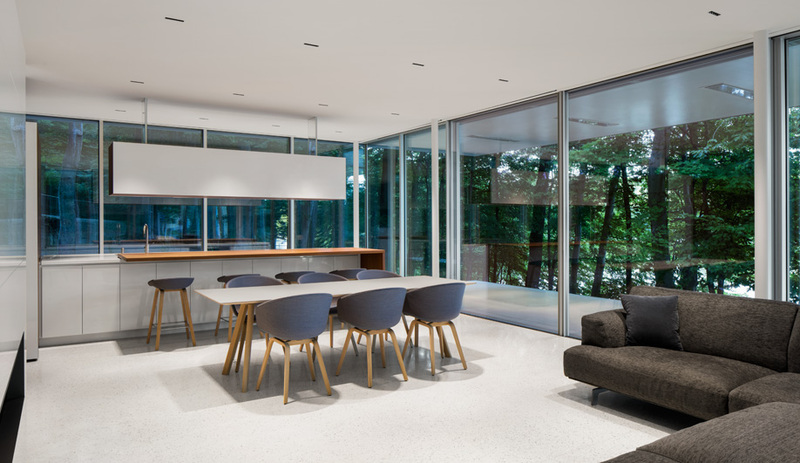 The indoor living areas are sandwiched in between, protected only by floor-to-ceiling glass. Built on the edge of a lake, Pavillon serves as a luxuriously minimal 115-square-metre guest house for a family living near Montreal. “We pushed a lot to get purity and simplicity,” says Renée Daoust, principal of Daoust Lestage. The guest house invokes the tradition of the rural glass house, one of architecture’s great contributions to modern life. 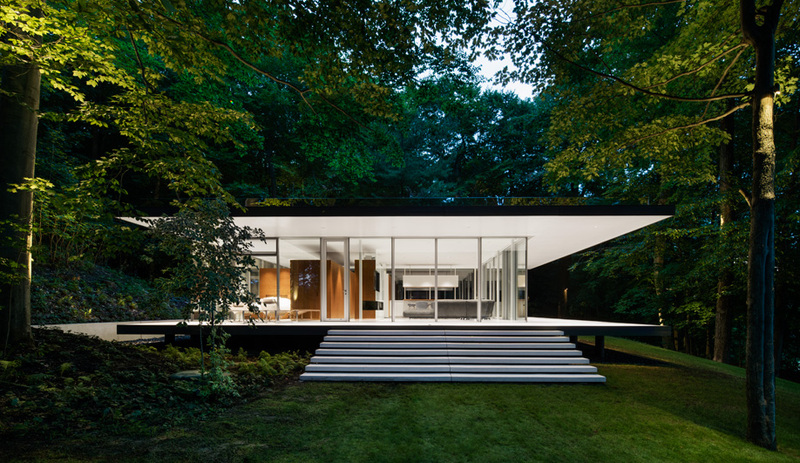 The lineage includes Mies van der Rohe’s Farnsworth House near Chicago and Philip Johnson’s iconic Glass House in Connecticut. But the Pavillon updates the classics in several ways. 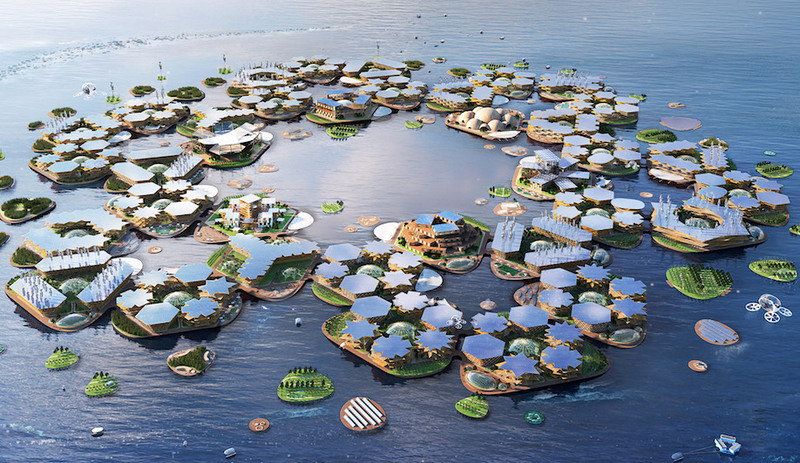 For example, Daoust’s expertise in sustainable design makes a substantial difference. The windows are triple glazed for better climate control, and, because the landscape rolls gently down to the lake, the floor slab is raised a metre off the ground, allowing the topography to run underneath. 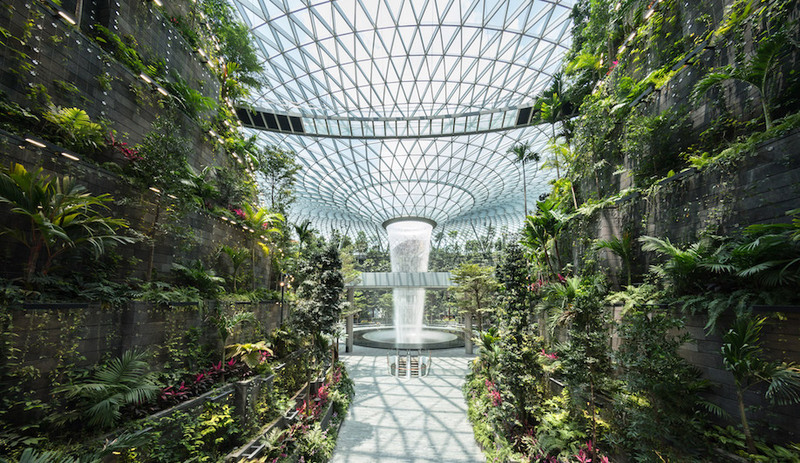 The house is topped with a green roof seeded with native plants, so that when visitors approach from above, the structure blends into the foliage. “The large overhangs help reduce direct sunlight, too,” notes Daoust. The main challenge of the project was to make the slabs appear to hover. The roof is held up by slender, white-painted steel columns, and, on the outside, the roof edge is sheathed in reflective aluminum panels. The polished white concrete floor flows continuously from inside to out, forming an L-shaped porch, and then descends toward the lake in the form of a prefabricated floating stair. At night the lighting bounces off the concrete floor and white-painted plasterboard ceiling, making the building glow like a campfire in the forest. “It works even better than we expected,” says Daoust. A black slate slab and crushed slate complete the landscaping. Inside, the floor plan is simple: kitchen and living areas on one side, two bedrooms on the other. In between, mechanical services and a bathroom are neatly contained within teak cabinets, with additional equipment tucked into the basement. The millwork stops 61 centimetres below the ceiling, where the architects have installed frameless, ultra-clear glass panels for sound isolation. This is a design where every detail counts. 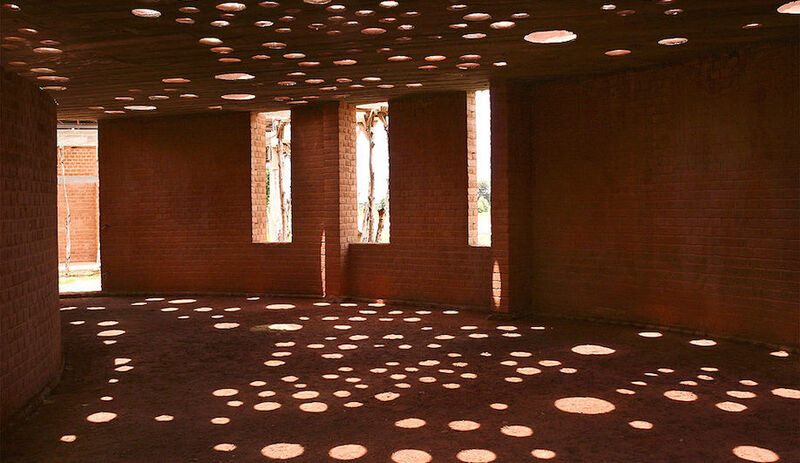 There are precise tracks in the ceiling for shades, and linear ventilation grills are recessed in the floor. Likewise, all of the door and window frames are installed flush with both floor and ceiling; immense pivoting and sliding doors span the full 2.9 metres. 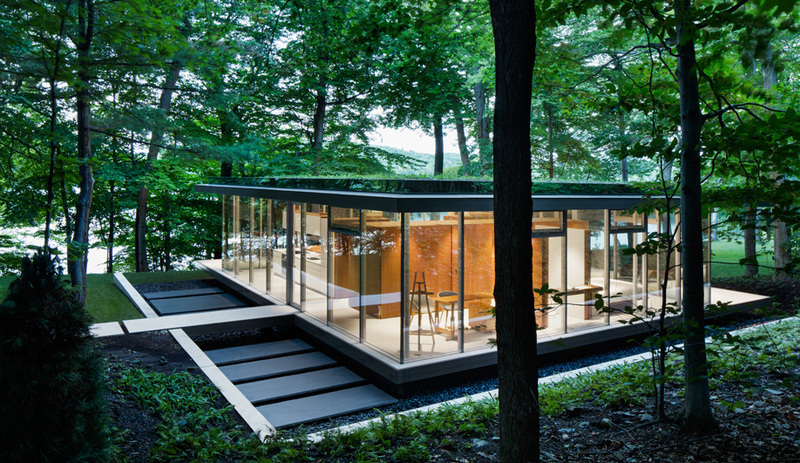 These details emphasize the mutable properties of glass – reflecting, transparent, shimmering or still – and together work to project the house’s occupants into the surrounding landscape, as if the architecture had disappeared into the forest. At dusk or dawn, the sight must be breathtaking.